This anecdote resonated with me. From a USAF Colonel, the core of this story and thinking is a timeless question: to be or to do? Having been in the IT industry for 29 years – and have always wanted to write software. Cut code. Create things. Do real things. For the last 20 years, my job has largely relied on being someone rather than doing. Now is the time to get into the doing. Creation. Making things. Long story short: after leaving Microsoft, taking 6 months off – the world of software development beckons. Honey laded Bee hives are very heavy. An apiarist, or beekeeper, places dozens of bee hives, usually clustered on standard shipping palettes, near nectar laden sources. In Australia, this tends to be in the bush – near flowering Eucalypts. The resulting honey has a slightly smoky taste: but is the best in the world. Around 1980, my Dad started a small cash sideline of Beekeeping to supplement the wheat/sheep farming that the Eyre Peninsula property had sustained over 4 generations. Country South Australia is a perfect location – especially on the fringes of a large reserve. You can place your hives on private property (with permission) and let the bees traverse into the reserve gathering the nectar. I see it as reaping from the government, albeit without damage (and in the case of plants, a benefit as the bees pollinate the trees). The trouble with bush locations is that they are remote, unpaved and not accessible by normal palette lifting devices. In warehouses, weighed down forklifts shuttle around isles of concrete. In the bush, the isles are sandy loam or clay – and the shelves are very very tall native Australian trees. My Dad purchased an old forklift and used this around the sheds for a time lifting and moving the heavy palettes of hives. This forklift did not travel well. You could not load or unload it from a truck; and the wheelbase and design were distinctly urban. Indoors. Definitely not for bush use. Land rovers, on the other hand, were designed for off-road use. Four wheel drive; rugged, simple & when purchased second hand – cheap. Another benefit of a Land rover is that you can put the thing into neutral, attach it to a tow bar and go anywhere. Once in the bush – they were in their element. Land Rovers, as built by Leyland, did not come with frontend palette loading equipment. So, in a flash of brilliance, my Dad took the lifting part of the forklift & attached it to the front of a Land Rover. The Land Rover’s engine & radiator was slightly repositioned to permit the hydraulics to fit in the engine compartment. Extra counter-balanced weights were added to the rear of the Land Rover. The petrol tank was also moved. The above is the Feep. As I recall, and this is some 30 years ago now, the first coat of paint (John Deere green) was complete by my Dad. The accenting (John Deere) yellow & the name – as you can see on the vertical forklift saying “FEEP” was painted by myself. To my knowledge, this is the word’s only Forklift Jeep – created by my Dad to help him lift & load heavy bee hives palettes in bushland. The genetics of innovation & creation have passed down to another generation. Maybe not as practical as a Feep, but they are there. On this topic, more to come in coming weeks. My first geek obsession started with cats. Or, as we now call them, kittehs. Quiet companions on the Autistic scale, kittehs added their warm furry friendliness to my pursuits – and were always more accommodating than humans. Therefore, I classify kittehs as a key moment in my geek origins. Along with kittehs in this photo are the collection of Airfix and Revell models. The history of World War 2, and the making of model aeroplanes was a rather unique pursuit in the middle of rural Eyre Peninsula. But I loved it. Oh, that and LEGO. 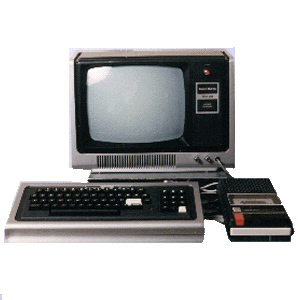 After being introduced to an Apple ][, on loan to our school from Angle Park Computing Centre, by a prescient Maths & Science Teacher: Mr Peter Stewart, I was hooked. From this early access, I also played with a TI programmable calculator and CP/M based Osborne 1. My Dad, sensing my inability to become the 5th generation owner of the farm, purchased a TRS-80 Model I. Oh wow, the fun I had with that computer was amazing. I owe Mr Peter Stewart and my Dad a great debt. Note on Angle Park Computer Centre: many South Australian Geeks of my generation began thanks to Angle Park Computer Centre. Stilgherrian, Frank Falco, Simon Hackett and David Newell to name four. Being a country kid, we relied on loaners. More cats: this time Bindi; with our/my first Macintosh: a 128K Macintosh. One of the first in South Australia: so first, it only came with a 110V power board! Thanks to Tim Kleemann from Random Access (later owner of Next Byte) – this Macintosh opened the door on a career & a love of Apple. Taken sometime in 1984 or 1985, this is me at my Macintosh. A harbinger of the next 13 years in the IT industry. Random Access, Adelaide. 1987. This is me at my desk, working away at some Macintosh things. Thanks to Tim Kleemann, Trevor Starke & Adrian van den Bok – and many others – I worked here happily doing Mac things. Thanks for the interview, Stil! Having visited Christchurch, South Island New Zealand many times; and Japan at least 4 times – I can clearly state they are some of the greatest places in the world to visit. The people are friendly; the sights and experiences are extraordinary. The places are relatively safe. It is with much inner turmoil and sadness to see both places crumble and sucumb to devestation. This only makes me want to revisit when the time is right, to show support. That their choice to live in a shaky place is not a ghetto nor a place to be shunned. Trip number 27 to the USA. I’ve almost lost count. I don’t think I’ll be back for another 12 months. It was cool to go up the Space Needle. And then get a head cold. Growing up on a farm, as I did, provides a freedom that never leaves you. My parents lived on and immersed directly in their work: the farm. It surrounded them, day in day out. I am sure I absorbed this environment in a way where I expect little to no separation between work and my personal life. From this stems workaholism and dedication. A deep protestant work ethic. There are significant downsides to total work immersion. Especially in this new world of always-on social media. You tweet a response to a work related question at 11.32pm, and follow up with a tirade against an airline cancelling your flight. The seamless melding of what is work and what is your life is one of the beauties of social media. We are all connected. Yesterday, one of the downsides firmly bit me on the bum. One of my personal opinions; a flippant tweet has caused an ongoing kerfuffle at Microsoft. This is not the first time I have come unstuck on the social media frontier; and sadly I am not alone. Nor am I the last to be bitten. There are many bums with bite marks. Until now, I have resisted the urge to have separate twitter identities. To me, creating and using different identities is the antithesis of social media. To be frank, I wish that I could be one identity on twitter. ; but there are forces in the wider world does not accept the separation of personal identity and an employerâ€™s identity. As I found in recent events, there is always the risk that someone will take an utterance out of context, and use this as a cudgel in pitiful internal office politics. Or, as others have found, fodder for gossip. The cleaving of identities is a topic upon which I have struggled throughout my Microsoft career. Being true to myself, whilst attempting to comply with the weight of an employerâ€™s expectations. As stated yesterday, I have created a new twitter identity @RealNickHodge which is a private, for people only account. Each follower is vetted. I am being careful not to let in bots and sensationalist journalists. I am also wary of "brand name" twitter identities. I follow real people; people who are smart enough to realise my opinions are mine, and mine alone. My old twitter account is now clearly identified @NickHodgeMSFT, with a profile stating my position and employer. As at the time of posting this blog entry, it has 4803 followers. I do not imagine the follower count will increase dramatically. Thankfully, formal Microsoft accounts such as @MSAU are doing an outstanding job of presenting a formal social face of the organisation. Within 24 hours of creating the new account, I have about 200 real followers, less noise and I trust more freedom to be real. Or at least the freedom from guilt in speaking as me, being who I am. I have been on twitter since February 2007 as @NickHodge. Nearly 4 years. In that time, my account has gathered nearly 5000 followers. Whilst I have no accurate data on these followers: it is fair to say a majority are spambots or dormant accounts. There is absolutely no way I am that interesting to 5000 people. Considering my twitter persona has been cheeky and somewhat iconoclastic, even to my present employer; and the content of 90% of my tweets are not related to work — I find it surprising to gather so many pieces of moss. 5000 followers does put the @NickHodge account into the top 20% of Australian twitterers. Being an open (not locked) account, this puts my utterances on twitter into the funnel for social media monitoring engines. Their systems will determine my follower count (and retweet count, and other metrics) puts me into a "must watch" list. I base this assessment on my work use of social media monitoring engines. Keywords, key people. Associated, and you are prime bait for engines to watch filter and report to their corporate stakeholders. Some people crave this attention. In fact, it is their life blood. I am perfectly fine with their need for followers, readers, fans if you will. But this is not for me. The direct association between my employer and what I say and think is not direct. At best, it is loosely coupled. There is no quick mechanism to completely delete all your followers, and who you are following in twitter. As an immediate solution, I have suspended posting from the @NickHodge account and created @RealNickHodge. I am being strict as to whom I follow; the account is locked. For me, it is back to feeling free to comment without the fear of causing collateral damage. In the middle of 1996, I was driving Chris Gulker and Bahman Dara â€“ fellow Apple employees â€“ to their hotel after just visiting the new Fairfax Chullora printing plant. Having spent hundreds of millions of dollars on very large presses, collators and distribution systems â€“ Fairfax were having difficulty in keeping colour consistent in their advertisements. For instance, a green tinged advertisement for meat at Coles would not generate sales. The CMYK to newsprint is a tricky business. It was not the colour problem that Chris Gulker mentioned. It was the rise of the Internet â€“ and the impact the internet would have on the printing presses. At this time, Avrilâ€™s The Definitive Christian Slater web site was getting reasonable page visits. Using the for-work of Chris, and Dave Winer, I embraced Frontier for the Fairfax@Atlanta web site. Chrisâ€™ comments, and followup discussion when I visited 1 Infinite Loop (as an Adobe employee in late 1998) definitely changed my outlook on the world. The internet was, and has, become king. Later Chris joined Adobe. Late in October, Chris died after a long battle with brain cancer. Even though my interactions with Chris were intermittent â€“ they were impactful. This is the mark of a good life. Vale, Chris.